← Daily Prompt: Ballerina, Fireman, Astronaut, Movie Star? If you give a dog a fish she eats for a day, if you teach a dog to fish, well………. Yes, it finally happened. For the two years we have lived here, Queenie, our Labrador Retriever, has gone down to the beach with us almost every night during the summer. While we stroll along, she walks or swims in the water waiting for fish to jump. People often comment with wonder why she stays in the water instead of walking along side of us. We reply “she thinks she is going to catch a fish.” We all have a good laugh. Meanwhile, our little dog, Bella, spends her time rummaging through the sand trying to catch ghost crabs. When she tracks one down, they head for their hole and she starts digging. 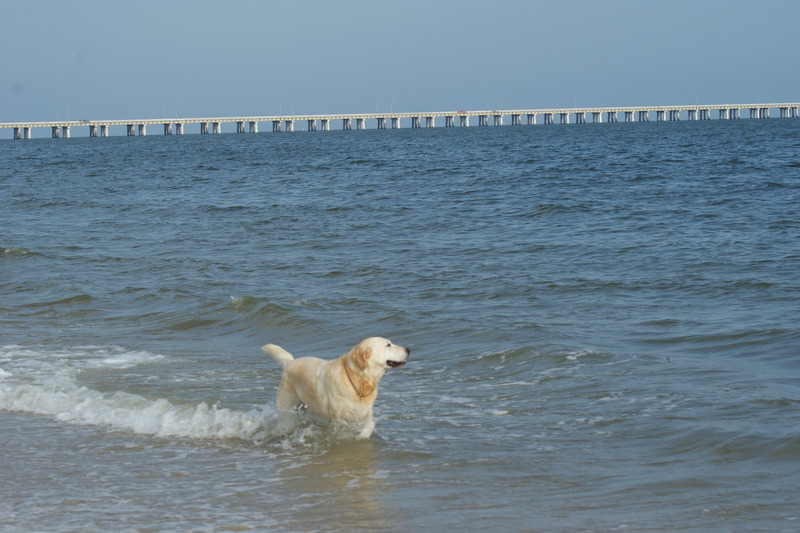 This entry was posted in Family and tagged crabbing, fishing, Labrador Retreivers. Bookmark the permalink. 50 Responses to If you give a dog a fish she eats for a day, if you teach a dog to fish, well………. I love Queenie. SO MUCH! And isn’t it always the way? I never have the camera ready when I need it! I don’t know about that. I remember some pretty good shots of Delilah doing her thing! Oh ye of little faith! If you check your backyard, you will see a plague of locusts descending on you. OK, so they’re more like cicadas. I let you off lightly this time. Al, my dear Pal. I know you’re Good, but does your wife know that you went and dropped an “o” from “Good?” 😉 She might not approve and then whose going to be watching for locusts? Good idea. I don’t think it will take much coaxing. Thanks for dropping in Lisa. Brilliant, thanks for the smiles, Queenie & her humans! Thanks Babs. You can just imagine the smiles it brought to our faces! You’re welcome, what a special dog she must be! I guess you could say the fish ‘croaked’! Good for Queenie! Always nice to accomplish a goal! Next up….teaching her to use a rod and reel. Now that she has caught one you will never be able to keep her out of the water ! There is nothing stronger than that animal instinct to catch and eat another animal. We’re not that many years removed from that ourselves. Now we just kill each other for fun. Don’t know how I got in this morose mood tonight. Guess I’d better go watch a Disney movie. I think it unlikely a Disney Movie would help, try Apocalypse Now, or Saving Private Ryan. Why is it so hard to find out how to spell Apocalypse properly? I should have picked The Deerhunter. Much easier to spell! Sorry. Duh! My desperation is showing. Lol 🙂 No need to be desperate, your readership is growing fast since you took the helm of the good ship NBFP:) have your stats reflected the increase in followers? I think ,maybe a little bit. It helps to post articles but I have been a bit slack on that lately. We have had the girls here a lot this summer so pretty busy with them. They were with us when Queenie caught the fish. During that same walk, Bella caught a crab but let it go and when Patty tried to pick it up from behind she got pinched anyway and started bleeding all over the beach. (It was pretty minor actually) That’s all the girls talked about all week. They just left with their mom this morning. We are in the process of recuperating (I’m sure your parents know that feeling). Isn’t it cool how this theme adds an outline to each new comment in a thread? My dog in New York loved to eat cooked macaroni. Sure beats eating fish. I’ll bet it’s a lot easier to catch too. But you only told us half the story – what did she do with the fish? Eat it? Throw it back? Good question, Tilly. After a while she started to try to eat it, which was disgusting, so we got it from her and threw it back. I expect some other denizen of the deep finished the job that Queenie started. I bet it was this >———–(*_*)———-< BIG! Kudos, Marie. That’s the first time I’ve seen anyone make an emoticon fish! Next thing you know she will be bringing home the bacon, or a pelican or two. For her next act, she will fight a pelican for a fish. My life is so unexciting, I have to write about my dogs! Aw, too bad you didn’t have the trophy photo. Dogs really love a trip to the beach. I think she is well satisfied she made a believer out of the two of us. Oh well she and you can relive it in your minds eye! I think she is still so surprised she caught one that it hasn’t sunk in yet, Cathy. What fun…and congratulations to Queenie. You’ll have to take your camera with you from now on…she’s full of surprises….for dinner! She never ceases to amaze, Cindy. If we ever run out of money at least I have a source to provide dinner. Poor Queenie. Without a picture, all the other dogs will think it’s just another one of those “you should have seen the one that got away” stories. Well, they’ll just have to read my blog then, won’t they? Don’t get me started on that lady! I still can’t figure out how she got out from underneath the house that fell on her! Hilarious!!! Hope you brushed her teeth. Nah. I just gave her a pack of Tic-Tacs. I am feeling jittery today and this post gave me my first smile and laugh! Thanks! Glad we could provide a little calming influence Elisa. They bring a smile and a laugh to me every morning.